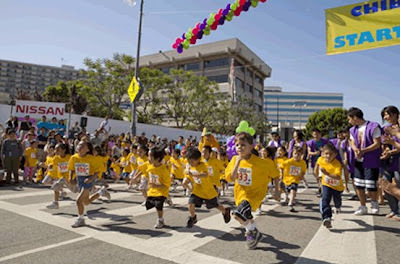 This weekend, thousands of people will descend on Little Tokyo to celebrate the 26th Annual Children's Day Festival, sponsored by JACCC. The event will feature the Chibi-K ("little person") kilometer run at 8 AM Saturday, a race for 4 to 12 year-olds (a sight to see). There will also be taiko drumming, an arts/crafts fair, a sushi-making workshop, and cultural performances. For those of us saddened by the Lakers' recent dismal performances, immediately following the Chibi-K will be the San-tai-San ("3-on 3") basketball tournament on San Pedro Street for 3rd to 7th graders. The sports event started 11 years ago to help raise awareness about the need for a recreation center in Little Tokyo, which has recently been named Budokan of Los Angeles. Hope you folks can come out and join us!